Lifestories: episode 100 is awfully milestone-y! started November 2010 as an audio podcast; restarted September 2014 as a video podcast with episode 26. Aunt Kristine's knitting school and holiday decorations going on. FO: Purple Princess Kristine: NaKniSweMo sweater, Princess Fiona, in STR Mediumweight. WIP: Kaylee Walks on the Sun - Sunwalker for the bigbadbergalong. Uses my handspun Kaylee's Parasol from Hobbledehoy and some Wollmeise from a destash. WIP: Barley hat with a button tab, I have the yarn now, Black Trillium Merilon Worsted for a Barley Hat. A few favorites: my ValentinesAllYear tunic and the convokal Nuvem and Neontastic socks (christmas 2014 project) and On Caspertine, with Love socks. present wrapping plans may include snowflakes. 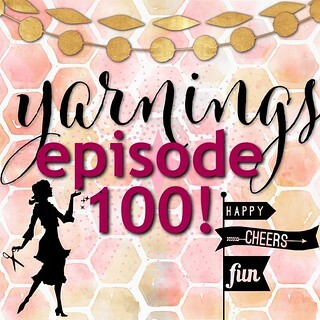 celebrating 100 episodes: share your yarnings memories in the thread on the ravelry group for a chance to win a fun prize or two. Showed off my prize yarn this week. why NaKniSweMo? Love to feel the joy of doing a challenge at the same time as others, and not even necessarily others who are sweater knitting, but others who are challenging themselves to do a task in a month, including NaNoWriMo. week 4: finishing. I like to knit a longer top, almost always. so I try and do much of the finishing steps with alternate ends or balls so then I can knit down as far as I can. 1x1 twisted rib makes such a nice edge, but my blocking mojo isn't always strong enough to make them stay flat. A folded hem is really nice (like my last year's NaKniSweMo) or the Motorway Roadtrip. Questions For YOU! how is your finishing game? what would you like to improve in the next year towards this? bgstats had an update for the more easily tracking challenges like 10x10 I've done this year and last. a favorite game series is Legendary. Sagas of Geekery: Now Watching: on the ABC app, Designated Survivor and Great American Baking Show. rewatching Once Upon a Time, started mid-season 3. on Netflix, The 100 season 3. favorites: I've watched so many amazing things in the few years - Marvel movies; new and old series; Person of Interest and Gilmore Girls stand out as new-to-me; The West Wing was such a smart show. Rewatching Stargate and Lost were so good. and always, always, Joss Whedon shows and movies! Sagas of Geekery: Now Reading: ready to start Hamiltome on audible. a favorite read recently: Better Than Before by Gretchen Rubin. Sagas of Geekery: Now Listening: starting on Christmas music. a favorite album is the Hamilton soundtrack. Fanciful Chatter: love showcasing my handknits with other supporting pretties like soft layering pieces from LulaRoe, sparkley jewlery from Chloe & Isabel, and fun makeup like Colourpop. Book of Cooking: my butternut noodles was the most exciting thing on a busy week - added extra ricotta this time. Happiness Continues: favorite keys to happiness or 3 provisions towards positive mental health: 1) my yoga class; 2) #wycwyc (and book); 3) theme of "progress not perfection".